The Lord only shares with us the things we need to know in their season. Jesus has been talking to the disciples about some very serious issues which He couldn’t speak to them about in the beginning of His ministry. Now it was time for them to hear these new instructions. This is one of the most helpful passages in Scripture to enable us to understand the workings of the Holy Spirit. The focus of Jesus’ teachings was upon the type of relationship His followers would have with the Holy Spirit… NOT the gifts the Holy Spirit brings to the relationship. This is very important for us to understand. If we would but first get the relationship correct with the Holy Spirit, then everything else would fall into place, including spiritual gifts. I wonder if there are any verses of Scripture more frequently misread than these in John 16. It is commonly quoted and read as though the Holy Spirit was going to come into the world and work directly upon the hearts of unbelievers, those who are not Christians. Those who read it this way leave the believer totally out of the equation. But if you read and interpret in this fashion, you have not read this verse correctly. This is not what Jesus was trying to communicate. Let’s read it again with an emphasis on a key word. I also want to take that same word and insert it in a place in verse 8 where it does not occur, but where the context makes clear it belongs. I think then you will see what I mean. In Scripture there are no breaks between verses. You see, the Holy Spirit is not coming to the world; He is coming to you, the church, the Christian, the believer. When He comes to the follower of Christ, this will convince or convict the world of sin and of righteousness and of judgment. I believe this is what Jesus was trying to communicate. The Holy Spirit does not come to the world; He comes to us. Unless the Holy Spirit comes into our life and abides in us, He will not be able to accomplish all those things Jesus wants done in the world. If the world around you is NOT experiencing the conviction of sin, righteousness, and judgment, whose fault is it…. God’s or Your’s? How many of us have gone to the grocery store in the past two weeks to buy milk, coke, juice, or some other type of drink. The grocery store always provides liquids in some type of container. We must have containers to carry our liquid refreshments. What if the store simply poured the milk into our hands? Obviously it would pour all out into the floor and be wasted. Well, at least we would get an ounce or two. God always pours out the Holy Spirit unto containers, or vessels, if you will. The Lord did not send the Spirit to “float around“, but to indwell the hearts and minds of believers. The Holy Spirit is not like “the force” in Star Wars. He is a person of the God-head. Because the Holy Spirit is a Person, we must be willing containers which desire a relationship with Him. The Holy Spirit will only get into the world (via) indwelling your life. If the Holy Spirit is not indwelling the world around you…it is because you are not carrying the Holy Spirit with you. You are an empty vessel. Jesus told us what to expect….I will send Him unto you! During the Great Awakening all Charles Wesley had to do many times was to stand up before people and they would fall into great conviction. On these occasions he didn’t speak a word. Why? Was it because of him? No, it was the Spirit that dwelt within him. 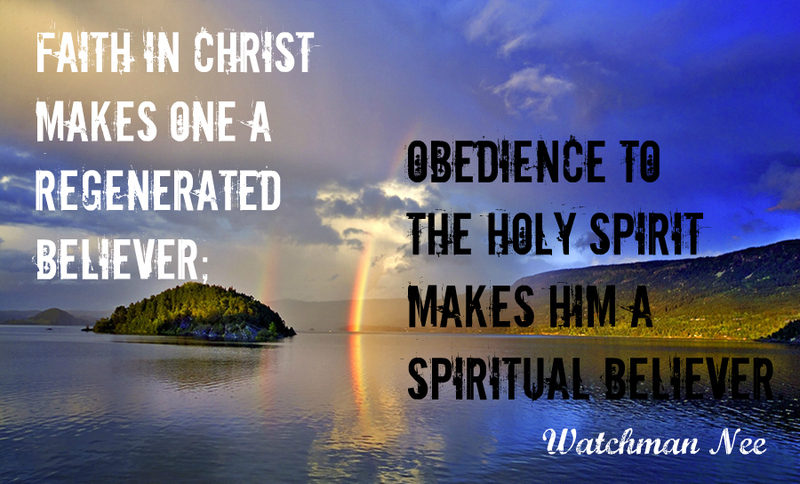 He simply became a container of the Holy Spirit. The more space we give Him, the more of Holy Spirit we will have. The Lord doesn’t want us to do the Holy Spirit’s job. This leads to man-made religion. Our job is to be filled.